Heat 2 cups of oil in a wok until hot. Add in mee sua and fry, turning over very quickly until golden brown. Remove as soon as it stops sizzling. 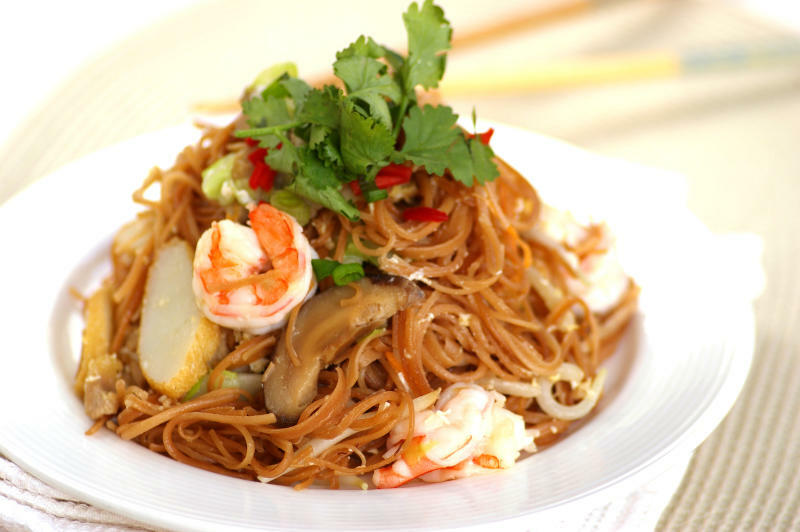 Scald mee sua in hot water for about 30 to 40 seconds until it is soft. Pour into a colander and drain well. Heat 2 tablespoons of sesame oil and oil in a wok. Sauté garlic and shallots briefly. Add mushrooms, chicken, prawns, carrot and fish cake and fry until cooked. Add 1 tablespoon of combined seasoning. Stir-fry well then dish out and set aside. Heat 1 tablespoon of sesame oil in a clean wok, add the eggs and scramble until cooked through. Dish out and set aside. Pour fresh chicken stock into the wok and bring to a boil. Add remaining seasoning mixture and bring to a boil again. Add the mee sua and the chicken, prawns and mushroom mixture to the wok. Stir-fry evenly until sauce is dry. Add scrambled eggs and toss to mix. Dish out and serve with garnishing sprinkled on top.